"I have searched for gluten-free, sugar-free cookies that didn't taste like hockey pucks and couldn't find any. So I made my own. 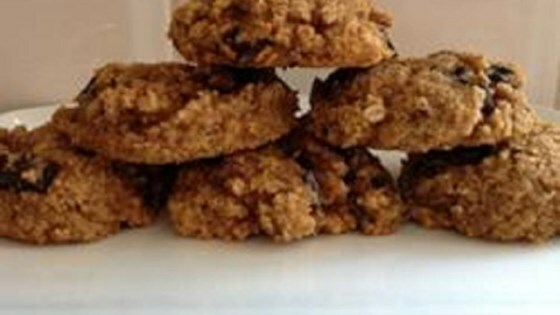 The banana and the applesauce make these cookies very moist and tasty. They are almost Palo friendly." Mash banana, applesauce, and honey together in a bowl; add almond butter, butter, egg and stir until combined. Add coconut flour, oats, chocolate chunks, tapioca flour, baking soda, cinnamon, and salt to banana mixture, stir until dry ingredients are moist and form a dough. Drop rounded tablespoonfuls of dough onto the prepared baking sheet. Bake until lightly brown, about 15 minutes. Let cool to room temperature, about 30 minutes. These cookies don't change shape much when you cook them, so go ahead and shape them the way you want them to look when you put them on the cookie sheet. These cookies are very moist and you may be tempted to cook them for longer, but don't. Just let them cool all the way before you eat them and they will be perfect! We had to change the almond butter for peanut butter, in the end we did not like the taste. The texture was weird and the cookies were dry/ crumbly. We think to use less oats in the mixture.